When you use a ListBox (or any other ItemsControl), you’ll most often populate the control by binding the ItemsSource property of the control to a collection. The Items property of the control can then be examined, if you want to look at the individual items in the collection. The example below adds a new Actor to a bound collection when a button is clicked. 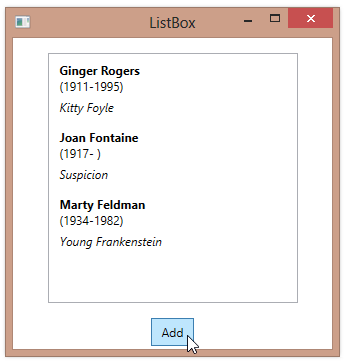 Note that the ListBox is updated immediately.